Price from: $692 - Book now! Welcome to Siem Reap, the provincial capital and gateway to the ancient Angkor temples. Recognized as a World Heritage Site by UNESCO, the Angkor Archaeological Park encompasses dozens of temple ruins including Bayon and the legendary Angkor Wat. Upon arrival, you will be met by our local guide and driven to the hotel to check in. More than just a circus, Phare performers use theater, music, dance and modern circus arts to tell uniquely Cambodian stories; historical, folk and modern. The young circus artists will astonish you with their energy, emotion, enthusiasm and talent. This show should be the perfect introduction about Cambodian culture and history. After breakfast, you’ll visit Angkor Thom, starting with its South Gate which is best known for the majestic doors and artifacts. Your next visit will be the Bayon, a bizarre structure of several architectural changes reflecting a switch from Hinduism (the foundations) to Buddhism (the superstructure), the Elephant and Leper King Terraces followed by a visit to Ta Prohm Temple, which is a wonderful combination of human genius and natural beauty with its giant trees that have grown there for centuries. In the afternoon, you’ll explore Angkor Wat itself, the largest, and for most people, the most impressive temple in the complex after which you can watch the sunset from the top of Phnom Bakheng Hill. Day 3: Siem Reap insight. Rise up early for the ox cart ride to get a true sense of the quiet life of rural Cambodia. Starting from your hotel at 5.00 AM, you will be driven by tuk tuk to Chreav village. Upon arrival, you will have chance to take a ride along dirt tracks aboard an ox-cart - the traditional form of transport here to enjoy the sun rise over the paddy fields. After that, you will tour through the village, seeing local people going about their daily life. Afterward, transfer back to the hotel for your breakfast and relax. Check out at noon and proceed to the one of the city’s lively open markets, Psar Chass, called the “Old Market”, where you can see the locals shopping and going about their lives. In the afternoon, continue your trip to Kampong Phluk floating village - a must see on Tonle Sap Lake. Board a boat and visit the floating village before heading to the nearby flooded mangrove forests. Then, you will be driven to a homestay where a cooking demonstration on traditional Khmer cuisine is arranged before joining with a local family for a cozy dinner and experience the most authentic Khmer lifestyle. Accommodation: Home stay in Tonle Sap Lake. After breakfast well prepared at your home stay, you will take 3,5h drive to Battambang via Sisophon. Upon arrival, check into your hotel and have a short relaxation. In the afternoon, you will take a slow 30 minute ride on the Bamboo train before visiting Phnom Sampov - an important religious site known throughout all Cambodia. During the Khmer Rouge period the mountain was used as a place to kill "enemies" of the regime and in what are known as the "killing caves" there is a memorial to these victims. Every evening at nightfall thousands of bats make their way out of caves in the hillside to feed before returning at dawn. Conclude your day with the drive to Phnom Bannon with its five sandstone towers on top of a hill and enjoy a magnificent view until sunset. Today you will cycle through countryside to explore Cambodia's rural way of life. During the trip, you will have some stops at villages to see local cottage industries, traditional scarf weaving and traditional farming. You will enjoy a traditional Cambodian lunch with a variety of Battambang's famous fish soup, vegetables, fruit and a refreshing coconut. The cycle is easy riding on flat terrain and if you would like to opt out of the cycling and hop on a tuk-tuk instead on the way back to your hotel, please inform your tour guide at the beginning of the trip for the best arrangement. Have breakfast at your hotel, the driver and guide will transfer you to Phnom Penh via Kompong Chhnang and Oudong. Along the way, you will stop at a pottery village and the floating village of Kompong Loung renowned for silversmithing. You will also take a stopover at Oudong, the former capital of Cambodia for the highlight of your trip. Upon arrival in Udong, begin your walk up to the summit of Oudong Mountain where you can see a number of old stupas and have chance for a Buddhist blessing ceremony about 5 - 10 minutes which brings you peace and happiness. Upon arrival in Phnom Penh, check in to the hotel and free at your leisure. Despite its recent turbulent history, Phnom Penh still holds an undeniable charm with its wide tree-lined boulevards and faded colonial mansions. After having breakfast at your hotel, you will join us on a full day city tour, visiting the capital’s main attractions. 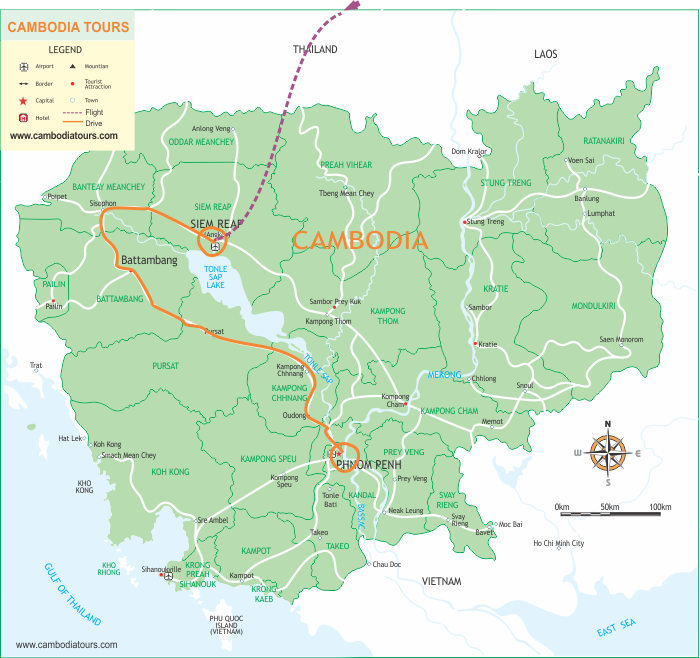 Start with a guided tour of the Tuol Sleng Genocide Museum and the notorious Choeung Ek “Killing Fields” to learn about the Khmer Rouge and Cambodia’s recent, bloody part of history. In the afternoon, you will visit National Museum, an excellent introduction into ancient Khmer art and civilization, and the Royal Palace, home to the royal family and the opulent silver pagoda. Later, take the leisure walk to Phnom Penh’s historic riverfront area where stands lots of restaurants, art galleries and silk shops, or perhaps visit the distinctive Central Market where you can buy jewelry, curios, clothes and souvenirs. Return to the hotel afterward and spend the rest of evening at your leisure. Day 8: Phnom Penh Departure. After having breakfast at hotel, enjoy your free time until the transfer to Phnom Penh International Airport for your departure flight home.